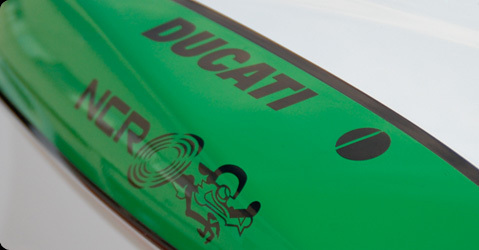 The NCR 848 is the result of a collaboration Ducati North America. This year, NCR was the official factory team of Dcati North America to compete in the PARTS CANADA SUPERBIKE CHAMPIONSHIP in the THUNDER Class. The team had two NCR 848's that were developed specifically to develop the full catalog of parts for this exciting new bike. The championship was contested across various tracks across Canada ranging from Calgary, Calabogie, Mosport, Shannonville and Halifax, Nova Scotia. The championship was hotly contested by oficial teams from Buell (1125R), BMW (HP2), KTM (Superduke 990) and other private teams. 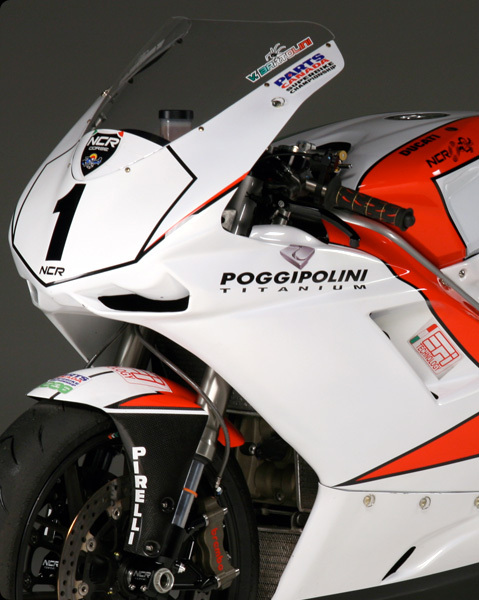 This impressive result was made possible by the vast development of special parts for the Ducati 848 and 1098. The performance, handling and mapping was continuously adapted to the ever changing requirements of the series. The NCR 848 developed into a true race bike with exceptional power delivery and handling making it a class leading package to be chased. Regardless of your race aspirations, NCR has developed a complete package to be used for racing or for casual track days. So you can choose a complete turn key solution from NCR or customize your own 848, 1098 or 1098R with unlimited solutions from NCR.